Fed up with hardness, rust, odor, or safety concerns regarding your family's houseshold water supply? Tired of the inconvenience and never-ending cost of buying bottled water? Aqua*Sure can often repair, modify or upgrade your existing equipment to make it work. OTHERS SELL EQUIPMENT -- WE PROVIDE RESULTS! Water purification in Winnipeg, filters, providing water, purification, water treatment, for pure drinking water, pure, clean, kitchen, home, bath, home improvement. 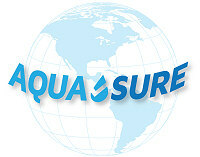 Aqua*Sure - Water Filtration Purification Systems Winnipeg, Manitoba water filtration purification, Canada.